I don’t know if I find this idea convincing. I certainly find it attractive. If you know of someone who’s tried to argue this way before, or if you have holes to poke in the idea, please have at it. 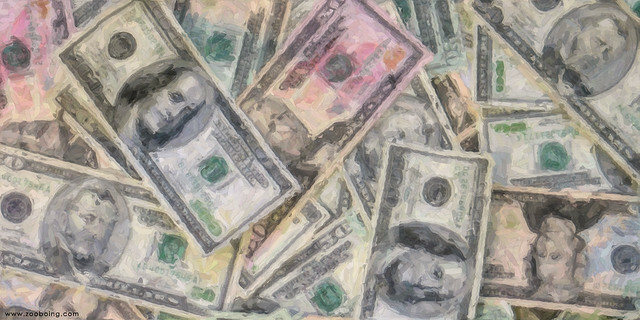 Art is an awful lot like money, but fundamentally incommensurate with it. Money functions principally as a store of value and as a medium of exchange. I’m proposing that art also functions principally in those two ways, just that the value being stored and the exchanges being mediated are of fundamentally different kinds. The point here is to argue for a value of art to society that’s on the same level as the value of money to society, while simultaneously arguing that art and money are structurally totally separate. I hope that the argument for the value of art to society helps advocates like me frame other arguments and proposed reforms. I hope that the separation between art and money helps push back on other arguments that try to measure art’s value purely in terms of economic activity or popularity-as-measured-in-price. If this argument holds up (which I’m not at all certain that it will), my fondest hope is that it can help people on the “art must measurably benefit society!” and the “art is beyond economic impact!” camps talk to each other productively. First up, the store of value part: Money is a great store of value. Much better than cheese, which rots, or blankets, which are only useful in cold places. Being able to measure my bank account in one thing is extremely convenient. The value stored in money doesn’t just exist as a number, either. It might later be realized in my life in the form of food, shelter, or anything else. Money can seem very cold, but the things it enables are richly human. Art similarly is a great store of value. It’s where we keep some of our most powerful experiences, either as creators or appreciators of it. Your favorite song from when you were 13? That one painting? That performance? Those novels with stories about how people behave, and how to handle all those tricky feels? That’s a store of value. I’m not just talking about the “transcendent arts experience” either. The creativity that surrounds you (really that you surround yourself with), and that you create is in many ways the substance of who you are, and how you define yourself in relation to others. This is the part of the argument where you should try to push if you want. Is it really “value” being “stored” if it’s not economic value? When we define money as a “store of value” the part where it’s all the same and you can count it is kind of crucial. Obviously we don’t have so simple a quantitative measure with art. Is it really the same kind of thing? I think I think so, but I’m totally not sure. I do find it an attractive idea though: art holding value in the same way money does, just a fundamentally different kind. Second, the medium of exchange part: Money is obviously a great medium of exchange. It’s standard, it’s uniform, frequently it’s backed up by a government, and I know that everyone else who might want to sell me something will take my money in exchange. Art, I’m arguing, is also a great medium of exchange. It’s how we swap the most complicated ideas from person to person. It’s how we pass on our culture and our values from generation to generation. It’s how we exchange all the stuff we can’t possibly exchange with money. You know, all that stuff that economists will tell us keep us from being “perfect rational actors”. From an economic standpoint, they totally do! And, I’m arguing, by definition they’re not going to be counted well in economic terms. So, that’s the argument. Art functions a lot like money (as a store of value and a medium of exchange), but for everything that money is totally inadequate to deal with. To me, this seems a lot more convincing than saying that we just haven’t figured out the right econometric approach to the arts yet, or saying that money is cold and heartless and art is warm and human and never the twain shall meet. This framework, if it holds up, gives you a way to argue that art matters, that economics matters, and that any society would be foolish not to value them both in roughly equal and non-overlapping ways. I’m definitely not arguing that it’s somehow impossible to buy art. Just impossible to deposit artistic value into a bank account. I’m also definitely not arguing that there’s something wrong with artists touching money, or god forbid making it. One of the viewpoints I hope to be able to fend off with this is the one that says that art should exist in a perfect moneyless environment. Taking this framework seriously means arguing that the world is interconnected and messed up and full of situations where these two things that don’t really mix come into contact. Plus, no matter how ineffable your job is, you deserve to be paid for it. This idea appeals a lot to me. It fits with a lot of instincts I have about this stuff. It seems like it will help me firm up a lot of other arguments. And it doesn’t seem to be completely wrong. Yet. Do you find it convincing? Has anyone else tried to argue this way that you know of?